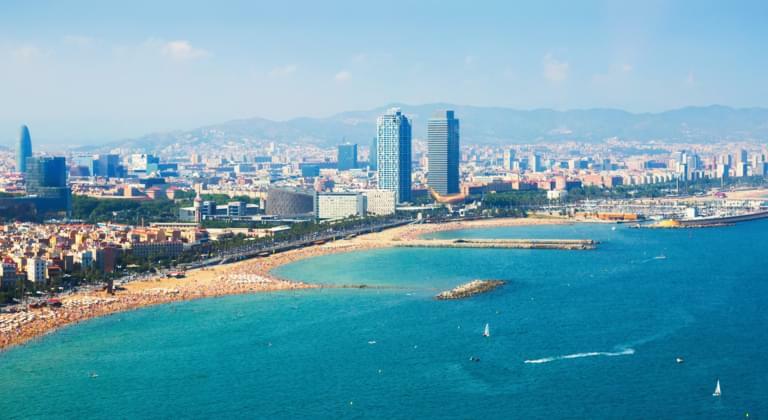 Barcelona is the capital of the province of Catalonia and is not only a Mediterranean city, but also of cosmopolitan importance. Here you will find remains of medieval districts from the Roman era as well as breathtakingly beautiful sights and buildings of the Modernisme-Stis or the avant-garde movements of the 20th century. It is not without reason that many of the emblematic buildings by local architects Lluís Doménech i Montaner and Antoni Gaudí have been included in the UNESCO World Heritage list. The city's origins go back to the time of the Romans. Such a long history, but also Barcelona's economic dynamism, leaves a cultural testimony of great importance. This can be seen, for example, in the city's broad art-historical heritage or in the new artistic trends that are constantly emerging. A wide range of cultural events, including exhibitions, open-air sculptures and exhibitions or a colourful music, dance and theatre programme are also part of this very special city. When you rent a car, you can explore Barcelona's attractions and the surrounding area in a cheap, fast and comfortable way. Barcelona Airport is an airport of international importance and is also called El Prat de Llobregat Aereopuerto. The IATA abbreviation of the airport is BCN. It is located about 13 km from the city centre and has two terminals. Terminal 1 is abbreviated to T1, the second terminal consists of three separate buildings. Car hire and travel from El Prat de Llobregat airport in Barcelona to your accommodation. BCN Airport belongs to the operating company AENA. It also owns other airports in Spain, which is why they are not only clearly arranged but also uniformly arranged. In addition, there are various exhibitions that are regularly presented on the airport grounds, such as exhibitions and guided tours of the airport's operation and history. You can eat and drink at BCN Airport in various restaurants, cafés and bars. You can choose between regional and international cuisine, but you can also buy a small meal at the many snack booths and vending machines. Drinks, whether hot or cold, are available in the various bars of the airport. You can get money at the many banks, currency exchange offices and ATMs located at Barcelona Airport. Bank transactions can also be done at the counter of Bank La Caixa, which is also located in Aeropuerto El Prat de Llobregat. If the bank is closed, you can also use the various ATMs located all over the airport in Barcelona. Withdrawing money, you can get there around the clock. On the ground floor of Terminal A and B there are also various currency exchange offices. There you can exchange money at the current exchange rates. If you want to call El Prat de Llobregat airport, you can choose one of the many telephone booths in which you can also make international calls. Letters and postcards can be handed in at the post office counter located in Terminal B on the ground floor. In the restaurants, lounge and business center areas, wireless Internet access is also available, which you can use after registering. In addition, there are 19 Internet stations at Barcelona Airport that can be found throughout the building. Of course, there are also several shops at El Prat de Llobregat Airport. There are different shops in each terminal. For example, you can buy clothing and accessories, media, electronics, souvenirs, food, books, newspapers and magazines. But you can also buy at low prices in the duty-free shops located behind the security areas. Souvenirs, spirits, regional products and tobacco are offered tax-free. Where is luggage collected at BCN Airport? As in many other airports, Barcelona also offers you the possibility to rent a baggage trolley to carry your bags and suitcases. Luggage lockers are also available if you are staying at the airport for a longer period of time. You can collect your luggage directly after the flight at the appropriate conveyor belt. Information on where it is located can be obtained on board your aircraft or from the flight attendants. In which terminal is the car rental area located? Barcelona Airport has five companies offering car rental services. There you can rent a car or pick it up at the pick-up station. The wide range of different vehicles and models is available from Hertz, Avis, Europcar, National Atesta and Sol-Mar. Every car rental company has a service stand on the ground floor. Information on your rental car can be obtained at Terminal 2B or 2C and on the first floor at Terminal 1. select your rental car in advance and book the vehicle you require at a favourable rate on the Internet and then pick it up at the pick-up point. Where is the pickup point of the car rental at El Prat de Llobregat airport? Depending on which car hire company you booked a cheap rental car with, the pick-up point is located in a different location. At which pick-up station you can pick up your car, you will be informed by an employee of the chosen car rental company. As a rule, the pick-up station of the respective company is located near the airport, so that you can not only rent your car at a reasonable price, but also get it directly at a nearby pick-up station. For more information, please contact the car rental service point. Explore the area with the car hire company of your choice. Located directly on the premises of Barcelona Airport, there is a Galp petrol station, which allows you to fill up your rental car at the pick-up station of the car rental company. The petrol station itself is located at the airport entrance. It is easy to reach by car. At El Prat de Llobregat airport there are road signs indicating the way to the petrol station. At the airport entrance, turn right towards the terminal. The petrol station is on the right-hand side. Even if you want to return your rental car to the car rental company, you can fill up your car again and return it to the car rental company. Rent a car and drive to the centre of Barcelona. Would you like to rent a car so that you are mobile in Barcelona and can explore the surroundings in a comfortable way? This is no problem in Barcelona, as the airport is connected to a well-developed transport network from which you can start your rental car. The city highway C31 is also known as Autovia de Castelldefels and takes you directly to the capital of Catalonia. Depending on the traffic, it takes between 20 and 30 minutes to get to the city centre by rental car. However, you can also take the C32 southbound from the motorway. There is a large Mediterranean road connecting all towns and regions on the Costa Brava. The signposting at the airport is excellent for all routes, so you can get there quickly with your rental car. At the service point of your car rental company, you will also find the information you need on all the routes you need. Rent a car and discover the surroundings of Barcelona. If you are travelling with your rental car in Barcelona and the surrounding area, you can make use of a well developed route network. If you want to explore Barcelona by car, you should adhere to the prescribed speed limits. Also note the alcohol limit of 0.5 per mille in Spain.